I think I have an unhealthy addiction to pasta and Parmesan cheese. 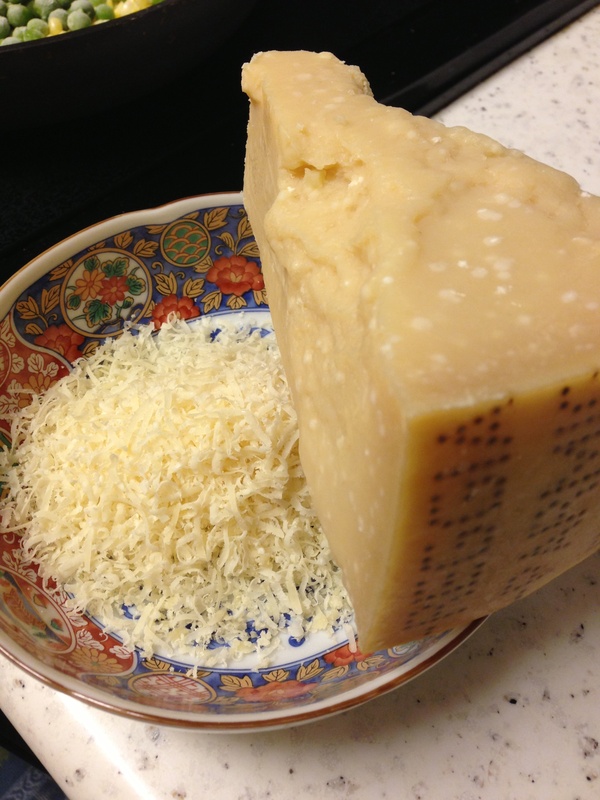 When ever I go visit my grandmother in Italy I smuggle the largest hunk of Parmesan cheese I think I can get through customs without being arrested. Exhibit A: Maybe it was my obsession with the children’s book Strega Nona and her magic pasta pot growing up that caused me to have sweet dreams of pasta flowing through the streets in abundance. So it seems only natural that it is now one of my favorite things to cook (although I would enjoy cooking it even more if I had one of those magic pasta pots). Cacio E Pepe is a Roman pasta dish that literally translates to “Cheese and Pepper.” This 3 ingredient dish (butter, cheese and pepper) is a staple in Rome. One of my favorite celebrity chefs from “Top Chef” Fabio, won’t hire a cook in his kitchen unless they can make this dish flawlessly. While its not rocket science, it does require some finesse to perfectly blend the butter and cheese into a creamy delicious sauce. I love buttery, cheesy noodles but since its summer and the farmers market is overflowing with amazing fresh vegetables I decided to give Fabio’s Cacio E Pepe a summer facelift. On my trip to the Canyons farmers market today, I picked up some fresh peas, corn and zucchini to saute up and serve atop the pasta. You could add just about any vegetable you like to this recipe, everything goes well with butter and cheese! 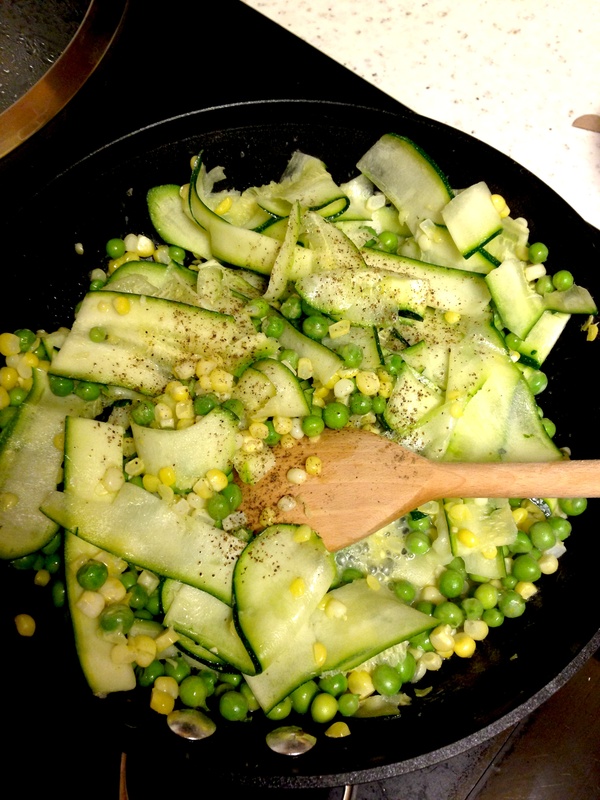 In a large skillet melt 1 Tablespoon of butter, add peas, corn, zucchini and white wine, cook until tender and most of the liquid has cooked off. Remove from heat, set aside. Add the pasta and cook to al dente. While the pasta cooks, melt butter in a large sauté pan over medium heat. Add the fresh cracked pepper. When the butter begins to bubble, turn off the flame and remove from heat. When the pasta is ready, reserve 2-3 tbsp. of the pasta water and drain the pasta. add the noodles and 2-3 tbsp. 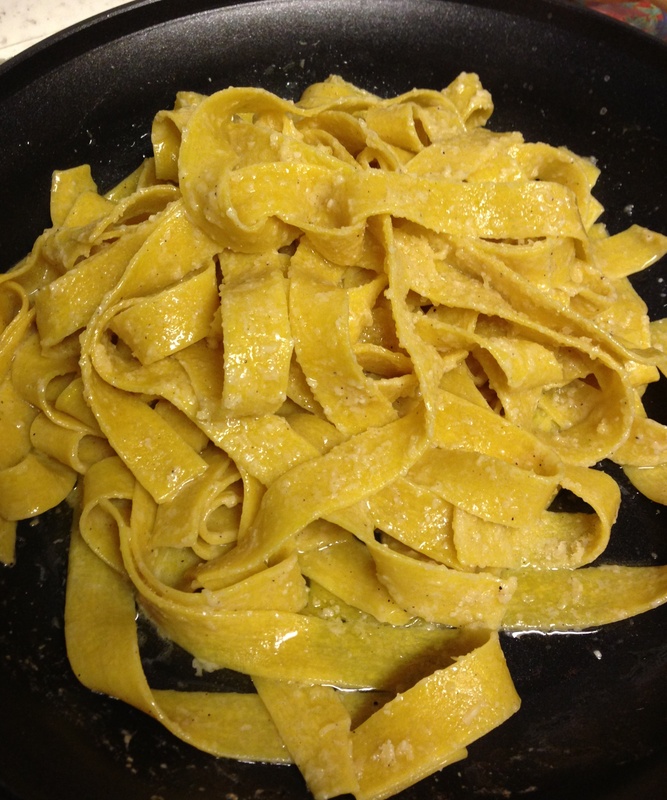 of the pasta water to the sauté pan with the butter. Cook over medium high heat until the liquid bubbles and thickens, tossing the pasta as needed. Remove from the heat and add the Parmesan cheese, tossing rigorously until all ingredients are incorporated into a creamy sauce. Add the sauteed vegetables, toss one last time to coat all the ingredients evenly. (This step needs to be done quickly before the creamy sauce cools and thickens too much). Garnish with additional black pepper and Parmesan, and serve immediately. Enjoy! 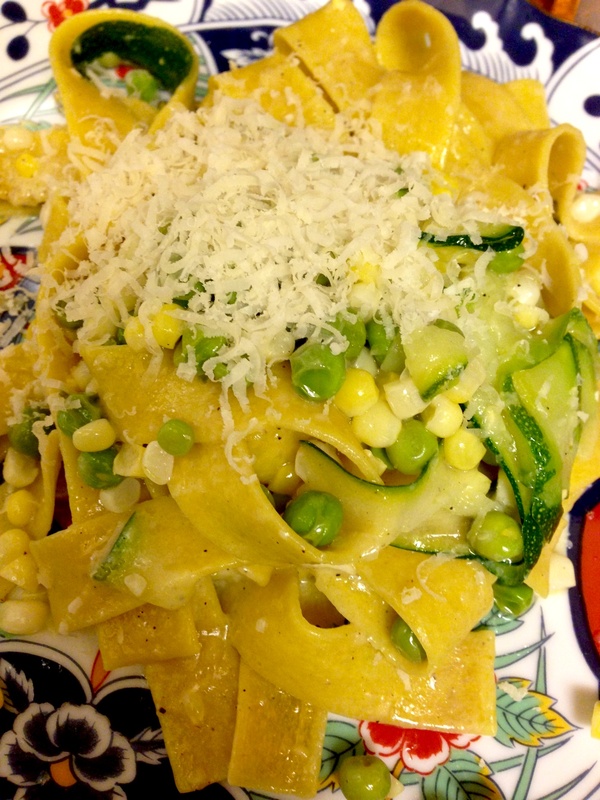 This entry was posted in Entrees, Recipes and tagged Butter, Cacio E Pepe, Corn, Fettuccine, Peas, Pepper, Spaghetti, Zucchini by skibootsinthekitchen. Bookmark the permalink. How can it not be good with a chef named Fabio!